﻿ This is a sketch of one of the daughters in my latest commission. The whole portrait commission will be 18x24" done in graphite pencil. Each head size will be roughly 4.5" which is as small as I like to go as the smaller the face is the trickier it is to fit in all the details that represent each subject. Her features have been blocked in and the light and dark values have been laid down lightly. 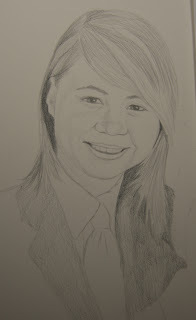 Her features are not exact yet as I tend to lay in the graphite and then refine the features to capture the resemblance.